Got a nice surpise gift that was waiting for me at work. I’ve been helping someone in Taiwan, Clarence Lee, with some information about Kona for his visit during the Kona Coffee Cultural Festival. And as a reward he stopped by the newspaper with a gift bag for me, a nice polo shirt from an expresso bar in Taiwan, Orsir Coffee Co. Clarence, I know you’re reading this so you can correct me if I’m wrong via comments. He’s the MIS Manager for the shop and has set up the webcam at the coffee shop and found me via this blog and we’ve chatted online a bit. As it turned out I was in Los Angeles during his visit to Kona so we didn’t get to hang out but the gift is most appreciated. Actually the photo of the gifts was an experimental shot I did from what I learned at the photo workshop. I shot the photo with the light from a little LED flashlight. It’s a technique called painting with light pioneered by David Black and he had a photo session I attended demonstrating it. In the demonstration he used the little LED flashlight to paint light over a model and motorcyle during a two-minute exposure. My subject was much smaller so I just did a 30 second exposure. Not too bad for a first try. 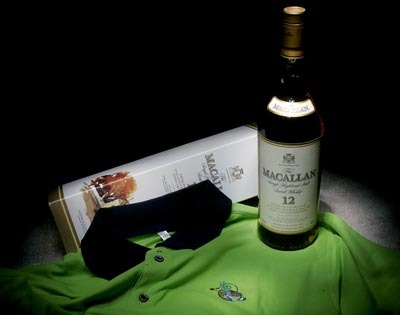 Mahalo Nui Loa for the whiskey and polo shirt Clarence.